The Indian Army has invited proposals for re-engining its BMP-1 ICVs with an indigenous 400+ HP automatic transmission powerpack. BMP-1 ICVs are currently powered by the 285 HP UTD-20 engine, which at times is found to be inadequate for cross country mobility, floatation and gradient negotiations. The laden weight of ICV BMP-I is 13(+2%) Ton and the Army wants the new Powerpack to improve mobility, acceleration and gradient negotiation capability of the ICV without compromising vehicle's floatation capability. 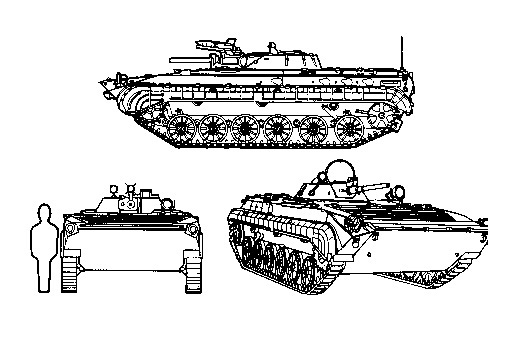 The proposed Powerpack should fit within the existing power pack compartment of BMP-1 without disturbing the ICV's centre of gravity or impairing any of its functional or operational characteristics including floatation. Even the existing final drive location is to be maintained. weight for enhanced power to weight ratio. It should be more fuel efficient and should offer extended service intervals. Fuel, lubricants and coolant used should be of the type for which indigenous equivalents are available and preferably of the same grades as those being used by other tracked vehicles in the mechanized forces of the Indian Army. Peak torque of the engine should be over 1200 Nm at 1300-1600 rpm. The engine should incorporate latest technologies with expected life of the engine (MTBO) exceeding 1200 hrs. Fitted with the new Powerpack, the ICV should be be able to achieve max speed of 65-kph on hard level ground, max mission mode max speed of 20-kph and min speed of 5-kph for 8 hrs. It should be able to negotiate gradients of 35-deg in soft sand/ loose sand/ hard level ground/ marsh land. Increment in the weight of BMP-I due to integration of the upgraded Powerpack should not exceed 500 kg. It must be ensured that amphibious capability of the BMP-I is not compromised due to the additional weight.